Insurance policies are eligible for Income Tax deduction or rebate under the section 80C of Income Tax act. But if you want to avail this benefit, you will have to provide a Premium Paid Certificate for all your insurance policies to your employer. Generally speaking, premium paid certificate is the certificate issued by your insurer stating the amount of premium you have paid in a particular financial year. Read more: Calculate income tax payable using an Online Income Tax Calculator. Even though you can approach your branch office to get premium paid certificate, many a times this will be difficult owing to various reasons. Who requires a premium paid certificate for claiming income tax rebate. Normally, employers will have all the details of the policies deducted through Salary Saving Schemes (SSS) with them. Hence you may not need a premium paid certificate for your SSS policies. Generally, policies paid through all other modes including ECS and NACH will require premium paid certificate to claim income tax rebate. Life Insurance corporation of India(LIC), through its newly launched e-Services portal provides an easy online solution to obtain premium paid certificate for all your policies in a single go. 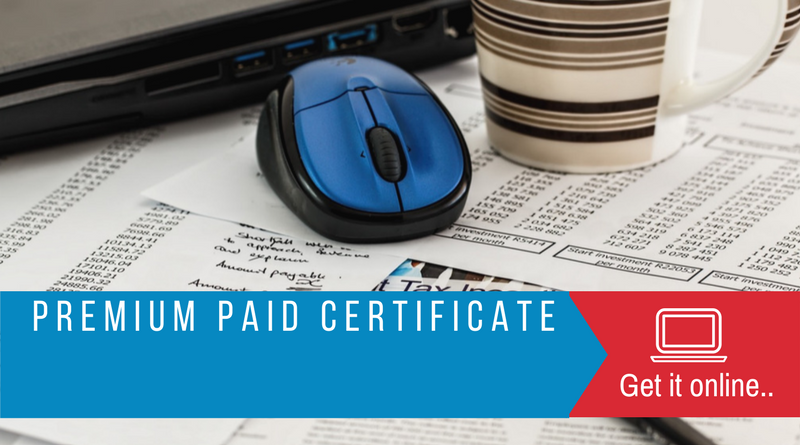 Steps involved in getting Premium Paid Certificate online. If you have already registered for LIC’s e-Services portal just login with your username and password. On the other hand, if you are a new user you should register for e-Services. Read a complete step by step guide on registering for LIC’s e-Services by clicking here. 2. Login to the portal using the credentials obtained while registering. You can login to LIC’s e-Services using your user name and password and filling the security question. 3. Go to the menu in the left hand side and select required certificate option. Another key point is that two types of premium paid certificates are available in the menu. If you have only one policy to include on the certificate, go to the Individual policy premium paid statement (option 2), as shown in the illustration. Where as go for a consolidated premium paid statement to include more than one policy in the certificate (Option 1). You can select the policy for which certificate is required, in case you have opted for individual policy premium paid statement. On the other hand, if you are opting for consolidated statement, no need to select any policy. A link showing ‘Get Premium Paid Certificate’ will appear and you can click on it to get the certificate. And to conclude, follow these simple step by step guide to get a premium paid certificate online to avail income tax rebate under sec 80C of income tax act. Read more: Income tax rules applicable for Life Insurance Policies. Sir, I wanted to know, is there any other software for LIC plan combination for windows os? I was developing a software with combinations but could not fully test it due to time constrains. I hope I ll be able to release it soon. You will have to take the premium paid statement for your policies including ECS policies to claim 80C benefit.